This exceptional book is the ‘deepest dive’ I’ve ever found in cultivating genuine mutual respect between parents and children. The 7 Keys provide specific, well-documented exercises and practical strategies that address family challenges, opening doors that are often closed, and giving everyone the freedom to really enjoy one another. Many parents won’t give up punishment because they think the only alternative is permissiveness. Other parents don’t understand the long-term dangers of permis-siveness, but they sure don’t want to be punitive. This delightful book shows parents how to get the best results for their children with respectful parenting tools that are neither punitive nor permissive. Gandhi advised us to ‘become the change we want to see in the world.’ Respectful Parents, Respectful Kids brings this time-honored wisdom up to date with simple, life-changing exercises. Know thyself. Communi-cate clearly, nonviolently, with purpose and respect and that is exactly how your children will treat you. This marvelous book shows you how. After decades of teaching and raising a large family, I can say with enthusiasm that Hart and Hodson have it right. This is a practical, generous, supportive, and loving book. A major help to parents. Refreshing, insightful, and informative, this book provides a long-awaited alternative to outdated parenting paradigms that are not satisfying for parents or kids. It helps parents focus on what is most important to them, and create deeper and more meaningful connections with their children. This is the best parent read since How to Talk So Kids Will Listen! Articulate, practical, fun and extraordinarily insightful, this book is destined to become the new manual in parent/child relationships. More than theory, the seven keys are real-life tools for creating more joyful, cooperative, loving interactions with our children: a must-read, must-do guide without question! confident that it will help heal the family pain and destruction from which they seek relief. 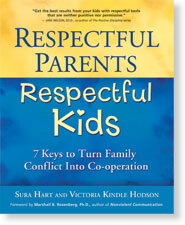 Superbly written and easy to read, Respectful Parents, Respectful Kids is a powerful and practical guide for parents everywhere. For those of you who long for more cooperation, mutual respect, trust, and harmony within the family, this book offers concrete useful tools that will help you immediately begin this transformation.